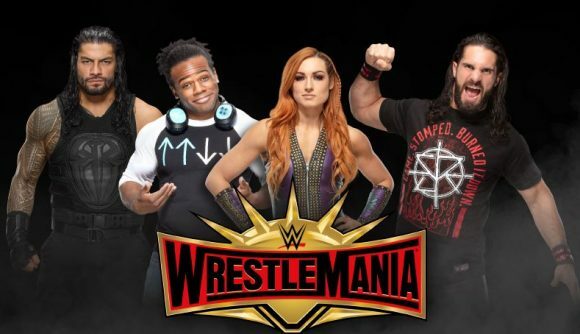 WrestleMania goes down tonight at MetLife Stadium in New Jersey, but you don’t have to wait to start getting excited for the action. A partnership between WWE and Roblox means you can now download four professional wrestling avatars to use in Roblox, plus exclusive WWE swag to wear in-game. You can download and play as 2019 Women’s Royal Rumble champion Becky Lynch, four-time world champion Roman Reigns, tag-teamer and YouTuber Xavier Woods, and 2019 Men’s Royal Rumble champion Seth Rollins. There’s also WWE Universal Championship and Women’s Championship belts to wear over your shoulder and a WWE-branded backpack and ball cap as well. The items are all available for free in the Roblox Catalog, and you can find them by heading to the official promotion page. While the characters are all rendered in Roblox’s chunky style, they’re remarkably well-detailed. Reigns’ right-arm tattoo sleeve is present and correct, and Lynch’s model wears her trademark ‘THE MAN’ top and permanent smirk. The accessories look great too, particularly the championship belts – the panels are done in raised 3D, each framed in jewel-encrusted gold. “Like Roblox, WWE brings a sense of play and fun into millions of people’s lives, and we’re excited to partner with them ahead of this landmark event,” said Craig Donato, Roblox’s chief business officer. “Roblox is also a unique way to immerse a new generation of fans into WWE as they can create, share and bring Superstar avatars and experiences to life,” said Jayar Donlan, executive vice president for WWE Advanced Media. WrestleMania starts tonight at 19:00 EST/24:00 BST, but you’ll be able to download these free WWE items until May 3.